These few words written on a beam in Lionel Wibault’s studio encapsulate the character of a man who fits no mould; he goes wherever and paints however he pleases and speaks as he finds. Born in Chamonix in 1947, Lionel WIBAULT is an imaginative and unconventional artist who is who he is thanks to two activities that embody two different lifestyles: painting and mountaineering. He combines these two crafts with a consummate flair that converts them into paeans to creative talent and freedom of expression. Lionel is the only son of Marcel WIBAULT, a regional artist who is today highly rated and sort after as a painter of mountains. As a child Lionel often slept in his father’s studio amidst the canvases and paints. Throughout his early years he watched his father paint with exceptional prowess. Brought up in an atmosphere of love for painting and mountains, Lionel has kept to his artistic heritage. Lionel the guide succumbs to his innate artistic drive and becomes a painter. His father offers early advice, telling him to “ capture the mountain’s structure”. Lionel therefore breaks free of the more realistic and pastoral style of his father. To mark the difference Lionel starts to sign his paintings WIBO. 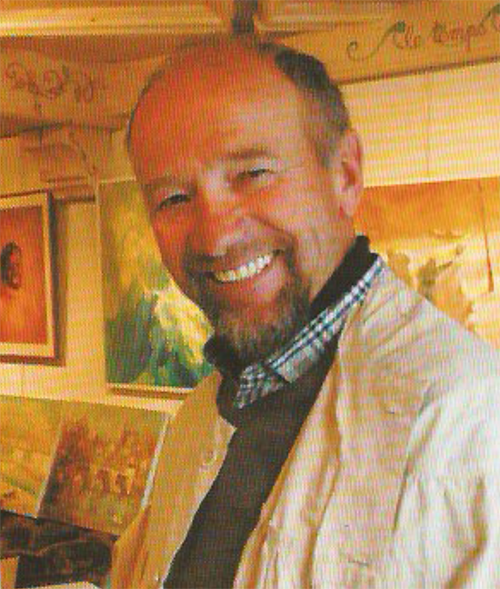 Lionel WIBAULT stores in his memory the infinite hues and beauty of ever-changing nature… He is perfectly happy to set up his easel in a place where he can catch a view of great beauty or take careful note of the colours for later use in his studio. In 1995 a television programme « Mountain » broadcast on the France 3 channel featured Lionel and Marcel WIBAULT and their shared passion for painting and the mountains. “Ridges of Light” “Ridges of Light” is a 26 minutes documentary by Gilles CHAPPAZ and Pierre OSTIAN. 1990 A floral fresco for the town hall in Chamonix. 1991 to 1998 Decoration of the Cosmiques refuge, that is located on the path that crosses Mont_Blanc. 1999 Lionel appears as a guide in the film “ Lead climber” (after the novel by Roger Frison-Roche) that was filmed in the Chamonix valley. 2005 Poster for the mountain guide’s festival in Chamonix. Produced an original painting from which a limited edition of 100 numbered copies were sale in aid of the mountain guide’s support fund. “Les Wibault jusqu’à peindre la-haut”.